As with OPTIMESS 1D, the robust OPTIMESS 2D light section sensor is based on the triangulation principle. In contrast to its one-dimensional counterpart, this can be used to measure not just distances, but also an entire profile – even under the most difficult conditions and across a huge variety of surfaces. Wird der Sensor oder das Objekt zusätzlich noch bewegt, können auch dreidimensionale Bilder gemacht werden. Damit wird der Sensor zum wahren Multitalent, von der Schienenprofil- oder Fahrdrahtverschleiss-Messung im Bahnbereich über die Strasseninspektion bis hin zu Industrieanwendungen ist man Optimess 2D auf der sicheren Seite. Der typische Messabstand reicht von 50 Millimeter bis zu 2 Meter, die Messraten 50 Hz bis 10 kHz. Je nach Anwendung und Wunsch sind auch kundenspezifische Ausführungen, beispielsweise ein Spezialgehäuse oder Schutzvorrichtungen, erhältlich. By moving the sensor or the object, it is also possible to make three-dimensional images. 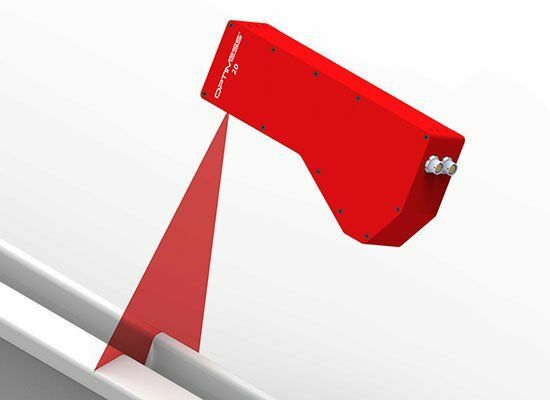 This makes the sensor an all-rounder, with OPTIMESS 2D putting you in the right position, whether you are engaged in measuring the rail profile or overhead wire – in the context of the rail industry – or road inspection, or broader industrial applications. It is typically sufficient to have a measuring range of 50 millimetres and 2 metres, and a measuring rate of 50 Hz to 10 kHz. Custom versions are also available in line with customers’ applications and requests; this might take the form of dedicated housing or safety devices, for instance.